The number of malnourished people worldwide has grown to 840 million — including 300 million children — even though there are ample supplies to feed them, a United Nations official said Monday. World Food Program Director James Morris said the number of malnourished was growing by about 5 million a year, but that there were enough available resources to rid the world of hunger. "There is enough money, enough food and enough goodwill in the world. Everyone simply needs to do a little more," said Morris, who was visiting Hungary at the invitation of Agriculture Minister Imre Nemeth. "If the world would be more thoughtful and just a tiny bit more generous, we can eliminate hunger, especially among children," Morris said. "It's the most powerful investment the world can make in its future." China has reduced the number of its own malnourished by around 250 million over the last 25 years, but the situation in southern Africa — also affected greatly by AIDS — is getting desperately worse, Morris said. Seven million people have died there because of AIDS, resulting in 14 million orphans, he said. "Life expectancy in southern Africa has decreased 22 years across the region," Morris said. As an example, he mentioned Zimbabwe, where life expectancy has fallen to 33 years from 68 years. "This is clearly one of the most serious sustained humanitarian crises in the world," Morris said. "I'm personally overwhelmed by it." He also mentioned the crisis in Sudan's Darfur region and its effect on neighboring Chad as the biggest emergency faced now by the World Food Program. 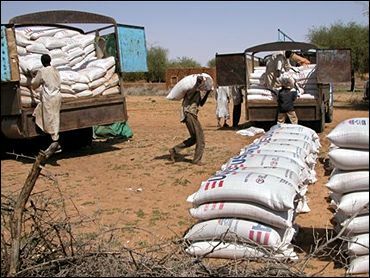 Morris said the United Nations expects to feed up to 2 million people in Darfur in October, compared with 1.2 million this month and 940,000 in August, plus an additional 210,000 Darfur refugees who crossed over into Chad. Morris said the World Food Program had a budget of $2.1 billion this year, down from $3.3 billion in 2003, when it provided enough food to feed the entire population of Iraq. "Several billion additional dollars would make it possible to feed every hungry child in the world," Morris said. "That would be an incredibly powerful use of world resources." According to the USDA, 11.1 percent of American households — 12.1 million households — in 2002 were "food insecure," meaning they did not always have access to enough food. That was up from 10.7 percent in 2001. From 2001 to 2002, the percentage of households where there was actual hunger rose from 3.3 to 3.5 percent.